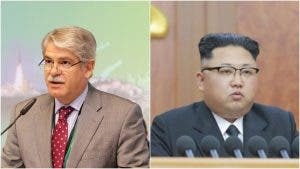 SPAIN has blasted North Korea’s latest nuclear test and warned that such actions by Pyongyang could affect its relationship with Madrid. The Spanish Foreign Ministry said in a statement yesterday: “Spain condemns in the strongest terms the nuclear tests carried out by North Korea today. “This is a serious provocation and a new unacceptable situation for the globe and for the regional security, as well as for the nuclear weapons non-proliferation regime, to which Spain is committed. North Korea claimed yesterday that it had successfully tested a hydrogen bomb that could be loaded onto an intercontinental ballistic missile, meaning it could reach Japan and US soil. Gosh! Bet that puts the wind up Kim Jong Un. He’ll probably cancel his break in Benidorm. Does Spain still have a relationship with this Mad Dictator! !